Several years ago, when my oldest kidlet was just about 6 or 7 I had a little idea for a Valentines Day. My budget was exceedingly slim, but I didn’t want the holiday to go unnoticed. 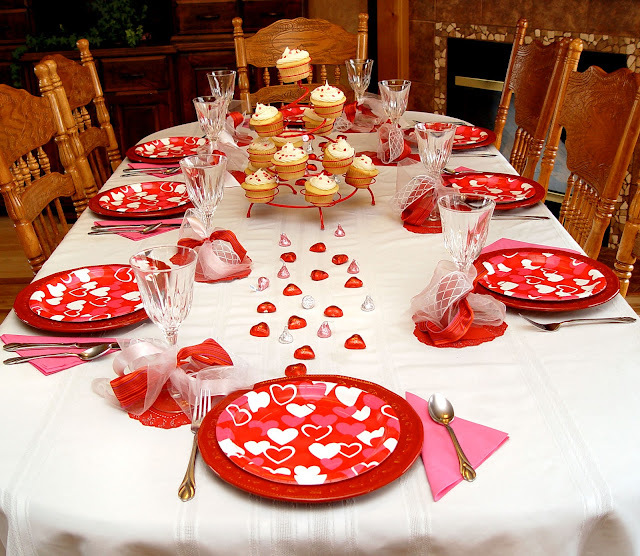 I got out the red and pink construction paper from the cupboard, cut myself a gazillion hearts and laid them out on the kitchen table, which I then set for dinner. Then made some kind of chocolate dessert…and dinner to go with it :). When my kids came home from school they were surprised to see such a spectacle. Paper hearts can be really spectacular, you know. I told them we were going to have a special Valentines Dinner, and wouldn’t that be fun. “Sure Mom. How come you’re being so like cool about everything?” came out of one daughters lips. “Just thought we’d celebrate as a family.” was my response. Again…who knew paper hearts were cool. The power of a little something out of the ordinary, I tell ya. While we were having dinner that night, I asked each person to take a little time and express something they loved about every individual sitting at the table. It was fun. And cute, pretty sure I got a little teary…which is nothing out of the ordinary considering I got teary this morning watching Little House On The Prairie. That show can really kill a person with hormones on the loose. This Family Valentines Dinner has become a tradition. We’ve done it every year since, some years with more success than other. One year someone passed gas, every child could not control their laughter, became hysterical with chuckling, shoulders shaking, tears streaming…and we had to quit early. It was a really loving year. We should be able to avoid this kind of behavior, at the very least on Valentines Day, right? Anyhow, I thought I’d share this little holiday tradition with you all. In case you have some construction paper handy and like a good family time. You really can make it special with out a lot of expense. Anything out of the ordinary makes it nice. This year I got busy at walmart buying some paper plates and napkins and that cute red cupcake stand. $6 my friends! Isn’t that cheap? Cupcake recipe coming tomorrow. 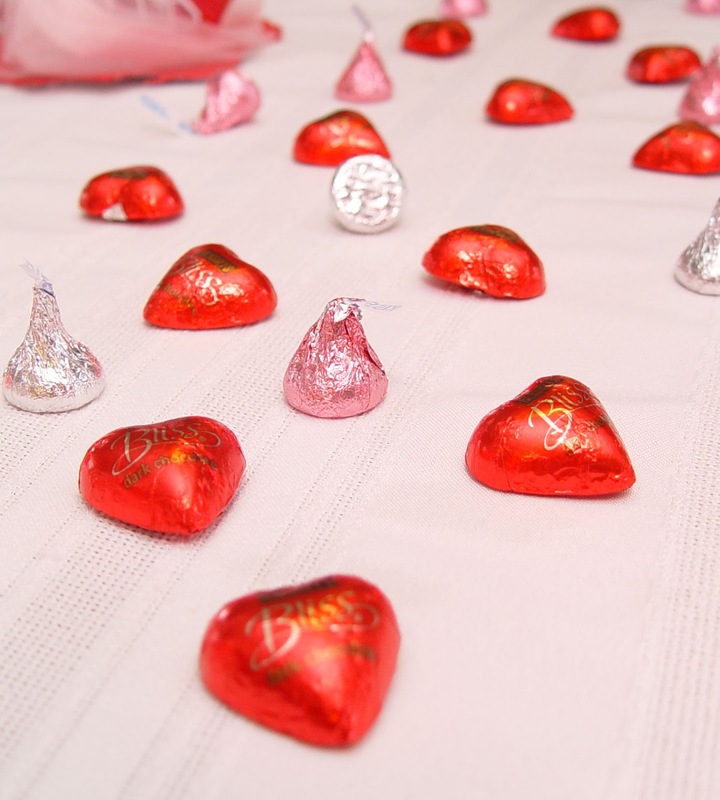 A little chocolate candy thrown down the middle of the table can be a real crowd pleas-er. Just ask these two ya-hoos. They were pretty disappointed when I packed it all up (after taking a bunch of photos for you all) and told them they would have to wait for Valentines Day when we would get it all back out again. Alright, I’m not that mean. I let them eat a few. Don’t call the authorities ok? I also took some leftover ribbon and tulle and made some “junk bows” to tie onto the goblets. Have you heard of a junk bow before? My sister in law Mary taught me how to make them. and pinch them together in the center. and tie all of the pieces together in the center while also tying it to what ever you are attaching it to. Then arrange the ribbons how ever you like. Makes for a fun texture and pretty display. See you back here tomorrow, recipe for the tasty cupcakes you see in these photos will be presented at that time. Have a great day! See you soon! 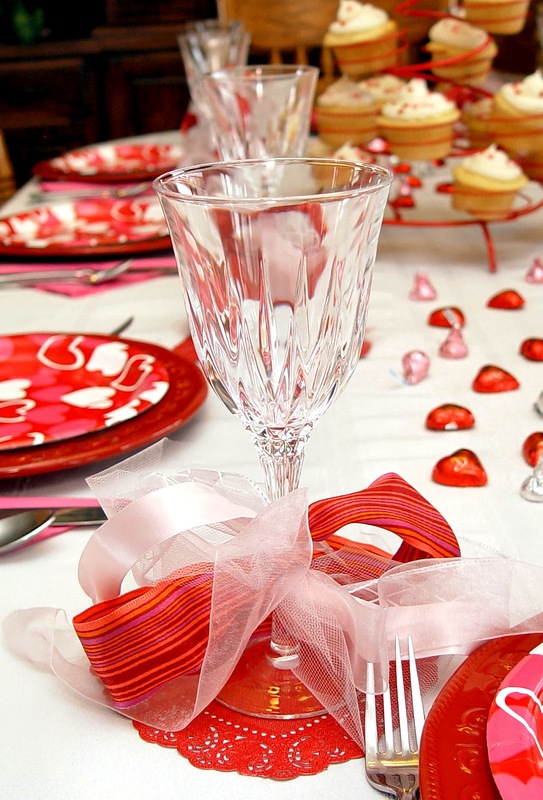 When my oldest was 5, I realized going out on valentine's day just wasn't feasible. So I threw the silver candlesticks we got as a wedding gift and had never been used onto the table, used the fancy glasses and tossed together a chocolate fondue. The kids loved it and get so excited about it every year. I think I might mix things up this year and throw in some paper hearts… I love the idea of having them tell each other what they love about them. We do Fondue every year for v-dvay, but I never thought to decorate. Definately changing that this year! Thanks for the ideas! Great ideas! I think you just motivated me. Quite a feat. Thank you! What a great idea! We will definitely be copying this family tradition for sure. Thanks for sharing! although I have to work that day, I will be cutting my little heart out the weekend before! Thank you for such a wonderful idea for my 6 and 8 year old daughters. They will be in heaven!! Those 'ya-hoos' sure are handsome. And I don't blame them for being disappointed that you packed up all the great table decorations – it looks fabulous! And thanks for the junk bow tutorial. That's something I can do – I can't tie ribbon to make a bow even look semi-decent, but that looks easy.